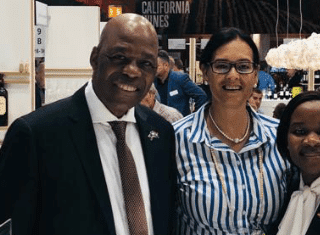 Sharing their year of birth with Nelson Mandela, KWV has been celebrating 100 years of excellence during 2018. 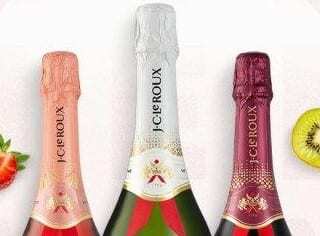 Whilst the year has been filled with many events and occasions celebrating a rich history and great brands, KWV has also been adding to their capability and assets to path the way to the next 100 years. 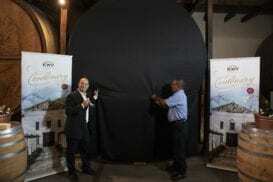 One of these is the opening of KWV’s spectacular Cathedral Cellar as a private events venue under the custodianship of KWV Ambassador Chef, Mynhardt Joubert. This beautiful space houses an impressive collection of thirty-two ‘stukvats’ measuring approximately 3 meters in circumference, serving as an imposing backdrop in the serene setting. These massive vessels also reveal the history of the South African wine industry, with stories carved on their façade. The first barrels were carved by father and son team, Karl and Karl-Heinz Wilhelm, in 1968 and 1970, who collectively stamped their art on twelve of the barrels. In 1987, in celebration of Paarl’s tercentenary, two new vats were added by South African artist Ruth Wolter. To prevent these vats from leaking she produced her works of art on separate wood panels, which were subsequently attached to the vats. Wolter’s work is a modern interpretation of the wine industry and illustrates KWV’s ability to transform over the years while preserving its rich history. 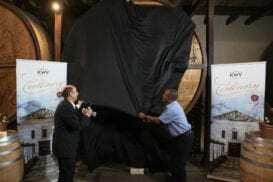 In a centennial highlight, the Cathedral Cellar served as the backdrop for KWV’s centenary crescendo: the unveiling of a brand-new carved barrel, as an apt illustration of KWV’s continuous contribution to the story of the South African wine industry. 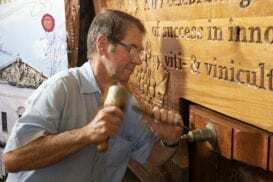 The latest work was done by wood-carving artist Ivan Hunter, who has provided intricate engravings for local and international commissions over the past 25 years. Echoing the father-and-son duo whose work inspired the Cathedral Cellar tradition, Hunter reveals that his craft is a continuation of his father’s wood sculpting abilities, whose carver’s tools he inherited. Inspired by KWV’s centenary, and the heart of this pioneering company, its Cathedral Cellar, the new work is a fusion of past and present, with the inscription, “KWV celebrating 100 years of success in innovative viti- & viniculture” carved on it. The formal unveiling was celebrated with a gourmet lunch by Chef Mynhardt paired with KWV’s premium Cathedral Cellar wine offering. 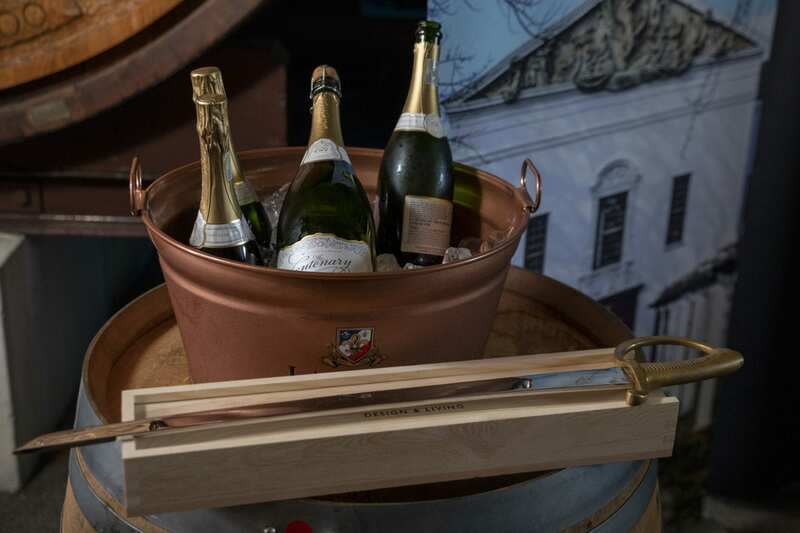 “With historical reverence, Cathedral Cellar wines embrace the present with this premium series, which is ready to enjoy now, but which will age gracefully in years to come,” said Chief Winemaker Wim Truter, in an official toast to KWV’s next 100 years. Visitors can view the collection of KWV’s carved vats on various tours provided by the KWV Emporium. 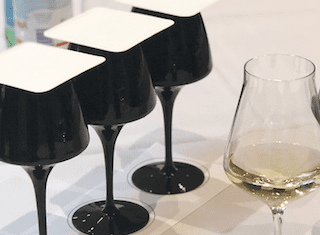 An official tour, called 100 Years in 100 Minutes, takes visitors on a journey through storytelling, and a walking tour of the cellars and the opportunity to taste some of KWV`s best wines – including a very rare and celebrated KWV 1949 Ruby Port.